EU Brexit chief Michel Barnier said on Monday the bloc would give Britain its “most ambitious” trade deal — but only if it meets the bloc’s stringent Brexit conditions. Barnier warned Britain it had to come up with a solution to avoid imposing a hard border between Ireland and British-ruled Northern Ireland if it wanted talks on its departure from the bloc to move on to trade. The Frenchman also said Britain would lose its “passporting” rights to let banks automatically do business in the EU after it leaves in March 2019. The EU is demanding Britain make sufficient progress on key areas including Northern Ireland and its Brexit bill before moving on to talks on future relations, including a possible trade deal and a transitional arrangement. “If we manage to negotiate an orderly withdrawal and establish a level playing field, there is every reason for our future partnership to be ambitious. This is our preferred option,” Barnier said in a speech in Brussels. “This is why we have started internal preparations with member states to talk about the future as soon as we have agreed on how to settle the past,” he told an event hosted the Centre for European Reform think tank. But Barnier warned that Britain had to decide whether to stick to EU standards on health, environment and workers’ rights or align itself more closely with other countries, following a recent call by the US commerce chief for Britain to follow American rules if it wanted a US trade deal. “Does it want to stay close to the European model or does it want to gradually move away from it? 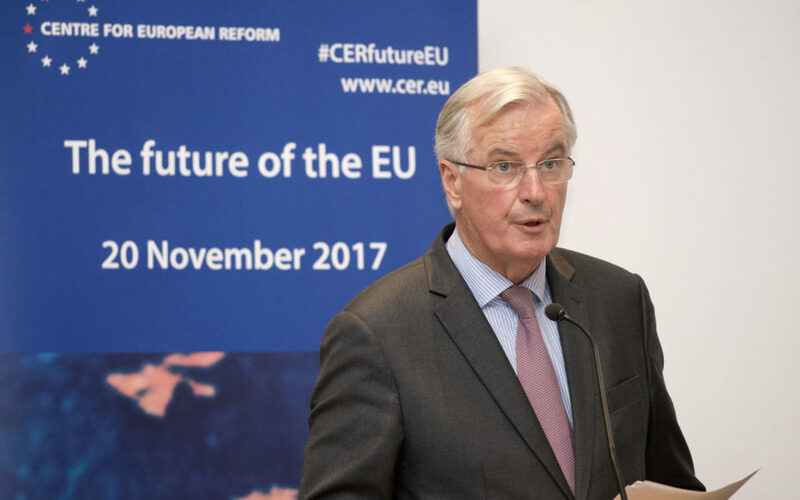 The UK’s reply to these questions will be very important, and even decisive,” Barnier said. The answer would affect the ratification of any Brexit deal in national parliaments and the European Parliament, he said. “I don’t say that to create problems, I say that to avoid problems,” added Barnier, a former French minister and European commissioner. The EU has given British Prime Minister Theresa May until the start of December to make sufficient progress on the bill, Ireland and the rights of EU citizens in Britain in order to move on to the trade talks phase at a summit on December 14. But Ireland has emerged as a major sticking point, with the EU insisting that Northern Ireland must effectively stay in a customs union with the EU to avoid a return of the “hard border” that characterised decades of sectarian violence in the region. “The island of Ireland now faces many challenges. Those who wanted Brexit must offer solutions,” Barnier said, adding that he knew it was “politically sensitive” in Britain. Barnier also spelled out that British banks would lose automatic access to do business on the continent through “passporting” — the process that deems all banks in a country to meet EU standards. “The legal consequence of Brexit is that the UK financial service providers lose their EU passport,” Barnier said. EU ministers meeting Barnier in Brussels later meanwhile kept up the pressure on Britain. “At the moment I do not see any chance to send a signal at the European Council in December that these negotiations can start,” said Michael Roth, Germany’s secretary of state on European Affairs. “The British will have to move and have to honour their contractual obligations,” Roth added. Belgian foreign minister Didier Reynders said that “if we do not truly advance on the principal points I fear that we have to give up imagining that there will be a deal” in December.